Magic PCO Coatings are the next generation of air purification technology, which can treat air pollution caused by more than 85% kinds of harmful gases such as car exhausts NOx, formaldehyde, benzene, VOCs. With the presence of light, photocatalyst produces hydroxyl radicals and holes (h+), which react with organic materials and harmful gases to produce water and carbon dioxide. 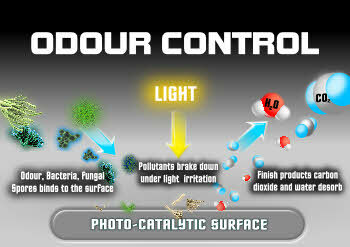 There is no extra pollution in the purifi cation process. The nano photocatalyst reacts as a catalyst in the chemical reaction so that maintains a longtime performance and it will never be consumed. What’s more, NanoMagic PCO Coatings works under UV and Visible Light and are suitable for indoor use where UV light irradiationis weak.